Diesel fumes appear to combine with artery-clogging fats to raise the risk of heart disease, research suggests. Scientists found the two act in concert to switch on genes that cause potentially dangerous inflammation of the blood vessels. They hope their work will lead to a simple blood test enabling doctors to evaluate the impact of air pollution on a person's health. The UCLA study appears in the online journal Genome Biology. Lead researcher Dr André Nel, an expert in nanomedicine, said the impact of diesel particles and cholesterol fats combined was much greater than the impact of each in isolation. He said: "Their combination creates a dangerous synergy that wreaks cardiovascular havoc far beyond what's caused by the diesel or cholesterol alone." The researchers focused on the interaction between diesel exhaust particles and fatty acids found in low-density lipoprotein (LDL) cholesterol - the "bad" type of cholesterol that leads to artery blockage. Both are sources of molecules called free radicals which cause cell and tissue damage, and can trigger the inflammation that leads to artery disease. The researchers combined the pollutants and fats and cultured them with cells taken from the inner lining of human blood vessels. A few hours later, they extracted DNA from the cells for genetic analysis. They showed that the genes that promote cellular inflammation had been activated. Next, they exposed mice with high cholesterol to the diesel particles, and saw that some of the same genes were activated in the animals' tissue. 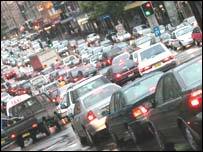 Dr Nel said: "Exactly how air pollutants cause cardiovascular injury is poorly understood. "But we do know that these particles are coated with chemicals that damage tissue and cause inflammation of the nose and lungs. "Vascular inflammation in turn leads to cholesterol deposits and clogged arteries, which can give rise to blood clots that trigger heart attack or stroke." Cathy Ross, cardiac nurse at the British Heart Foundation, said it was already known that prolonged exposure to air pollution resulted in a small increased risk of death from heart disease and stroke. She said: "For most people, we know that everyday measures such as eating a healthy diet low in saturated fat, taking regular physical activity and giving up smoking will have more impact on reducing the risk of developing heart disease. "But, anyone with chronic lung disease or coronary heart disease should avoid staying outside for long periods when pollution levels are high."